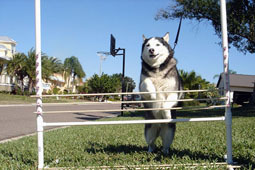 The Siberian Husky is a natural born athlete. When at a full run one can see the real beauty in this breed. 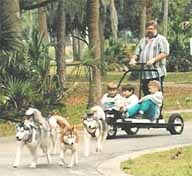 Siberian Huskies do require daily exercise in some shape or form. Some people feel they need an acre or two to be a "proper" home for a Sibe; this is a common misconception. 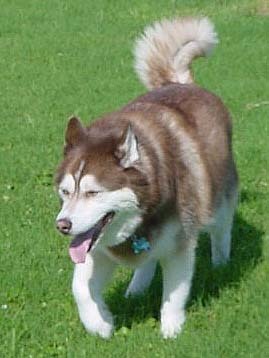 While Siberians love to run for long distances and are very fast, adequate exercise can be achieved within a small fenced area, lots of play and/or with 2-3 walks daily. But do keep in mind these dogs were bred to pull 6-8 times their own weight and should not be left solely in the care of a young child or an adult who is not very physically fit. 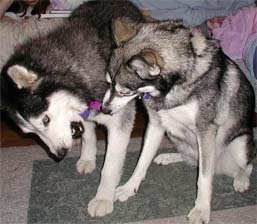 Ask any multiple Siberian home about "playtime". To watch Siberians play is pure entertainment in itself. Why wait in long lines or pay for season tickets! Some owners equate it to watching sporting events. "And Chinook body checks Juneau against the sofa." "Hey, that is illegal use of the paws, 10 second time out!" "And here's Sasha coming up on the left, but what's this??!! Nikki comes from behind and leaps right over Sasha to take first place." Why buy cable when you have free entertainment and all it requires is a couch and a cool drink. Sit back, the entertainment is about to begin! Siberians will always find a way to amuse themselves almost anywhere they go. This is why it is VERY important to find ways to keep them entertained. With their high intelligence and power, they can be a handful for any unaware owner. 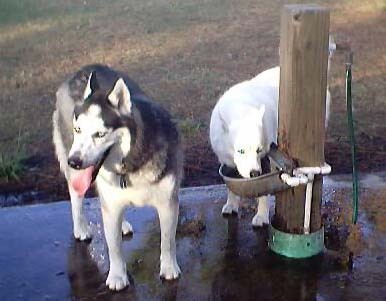 Zeus, Moose and Kita take a break at the Dog Park to get a drink. 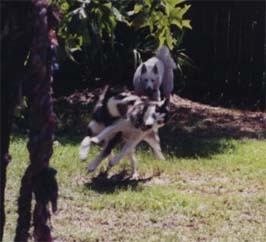 Kavik loves to run in his yard! Bear initiates play with his sister Foxy! 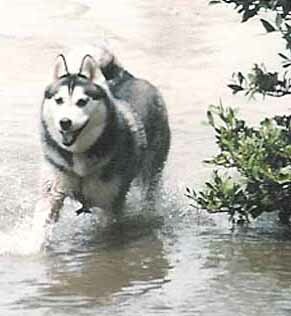 Buffet is a true "water" dog and loves to run in the surf! 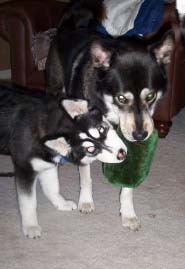 Gracie wants to play with Lakota's green squeaky too! Sheba supervises as Koya and Nikki play a game of tag! 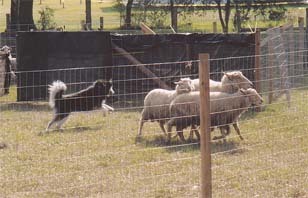 Aurora proves Sibes can herd... and not end up with Sheep on the menu!